FIVE YEARS AGO today, at 6:19 p.m., the State of Texas took the life of my friend, Rogelio Reyes Cannady. Ten more days and he would have been 38 years old. He had been behind bars more than half of his life. I got to know Rogelio because of a column I wrote for USA TODAY in 1998, about being Mexican. Rogelio read it and wrote to his Swiss pen pal, Isabelle, that he liked it. She took it upon herself to contact me to encourage me to communicate with him. I resisted for months, but I eventually relented and wrote my first letter to him some time in 1999. He responded not long after that. We continued exchanging letters, averaging at least one a week, until he died. In fact the last two letters I got from him arrived on the day he died. Through our correspondence, we became friends and it was inevitable that sooner or later I would visit him in Livingston, where he was held after he was sentenced to death. Our first visit was in late April 2000. I had come to Houston for the get-together commemorating the 5th anniversary of the death of The Houston Post. I was living in Washington at the time and, fortunately, my work required that I fly to Houston a lot, and that allowed me to visit him several times a year. Rogelio always had great hopes that his conviction would be overturned and he would not be put to death. But he was a realist and he knew that his chances were slim, and so he asked once if I would be a witness to his execution and I promised him that I would. I was not able to keep that promise for reasons that are too complicated to get into here. Those same reasons prevented me from visiting Rogelio the last year of his life. I felt bad about it but he understood. We continued exchanging letters until the very end. Many of those letters contained posts for a blog, DeathWatchJournal, which he had asked me to start for him. He wrote them in longhand and I typed them into my computer so I could post them. As the day of his execution approached, I walked around overwhelmed with dread, loss, guilt, and other gloomy feelings. I had written my farewell letter to him and I knew I would get a similar letter from him, but that somehow felt inadequate and I was angry at the events that conspired to keep me from speaking with him one last time. 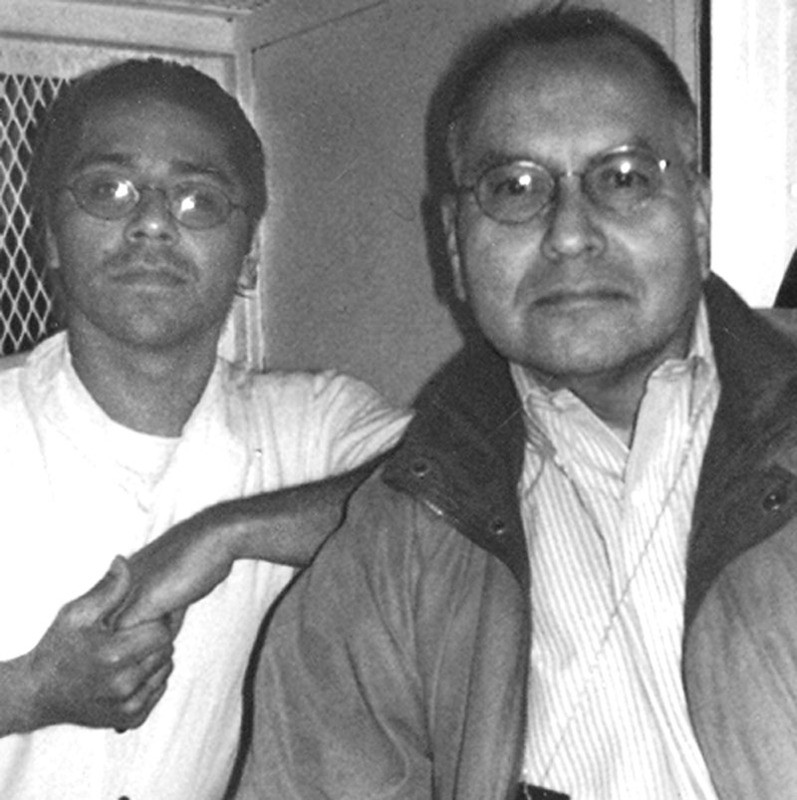 Then, on the evening before his scheduled execution, I got a phone call that I was to call Rogelio at the Walls Unit, in Huntsville, where he was to be killed. He would be allowed to receive calls from a handful of family and friends and I was one of them. I was at my desk when I called him and, as we began to talk, I picked up a pen and started writing down what he said – probably my old reporter instincts kicking in. I’m glad I did, because my memory is so bad that I am sure I would have forgotten most of it. THIS AFTERNOON I had a 25-minute conversation with Rogelio. He was already in the Walls Unit, in Huntsville, in a room next to the execution chamber. With him was a chaplain. He was drinking sweet iced tea and had asked for a cigarette. They had offered him some cookies from a tray nearby but he refused because he wanted to save room for his last meal: beef and cheese enchiladas, two cheeseburgers, fried chicken and strawberry cake. He hadn’t eaten all day because he wanted to be able to eat everything. He was in amazingly good spirits, at peace, understanding that even though technically it was still possible for the courts to intervene, he will likely be dying at 6 this evening. He spoke of “three amazing days” of visits with his beloved Norma [his girlfriend] and his family. The days were divided into 10-15 minute visits with each of his siblings and Norma. Pictures of them together were taken and he promised that Norma would share them. He spoke of his sister’s breaking down during one visit and his admonishing her. He told her that it was OK, to go ahead and cry. I told him about the many wonderful comments and prayers on his blog site and he asked that I pass on his gratitude “for everyone who reached out to me, who understood, who supported me.” He added that he I appreciate their support. After our call, he was planning to speak with his siblings, and with Isabelle, Tina and his attorney. And, of course, Norma. He said he’d been talking to the chaplain about the drug administered to put him to sleep before they administer the lethal injection. “He said it is just like when they put you under for surgery,” he said. “You don’t feel a thing.” And he talked about los queridos who have gone on before him. His cigarette arrived, a Marlboro Lite, and he lit up. I could hear him inhaling and savoring. I asked how it tasted. “Man,” he said again, and in my mind I could see that wide grin of satisfaction on his face. Then he started coughing. “This stuff is bad for you. Cigarettes will kill you,” he said, laughing at his own joke. He talked about the conversation he’d had with the warden when he arrived, when the official explained the procedure to him. He told the warden that when 6 o’clock came he was not going to walk into the execution chamber. “I’m just going to lie down and they’ll have to carry me in,” he explained. “I’m not going to walk in there voluntarily. The warden said he understood. Finally, he thanked me for my friendship and support. WHEN I FOUND out last night that I could speak to him today, I was not looking forward to it. I was scared. I had heard he had been in bad shape during the first part of the week and I didn’t know what condition he would be in, and I didn’t know what condition I’d be in. But within seconds of the start of the conversation, I was at ease. It was as if I was sitting in front of him, looking through the plate glass partition on a regular visit. I have been dreading this day for weeks, and my heart has been heavy with grief, but following our conversation, I feel as if a great weight has been lifted. I got an opportunity to say goodbye to my friend and he reassured me that he is OK. When I got home, there were two letters from Rogelio, his last two, with several blog entries. I will post them later. I don’t have the strength to do that tonight. I JUST HEARD that the Fifth Circuit Court had turned down Rogelio’s appeal. It is being appealed but his lawyers don’t have much hope, so in about an hour, Rogelio will be carried into that room. He’ll say his final words and he’ll be gone. “Condemned Texas inmate Rogelio Cannady was executed Wednesday evening for killing his cellmate while already serving two life sentences for a double murder. “Cannady, 37, from Harlingen, didn’t deny fatally beating 55-year-old Leovigildo Bonal with a belt and padlock in October 1993, but he insisted the attack at the Texas Department of Criminal Justice McConnell Unit in Beeville was self defense from Bonal’s sexual advances. “In the death chamber he smiled and nodded to his brother, a niece and three friends he selected to witness his death and told them repeatedly he loved them. ‘As he waited for the drugs to take effect, he laughed and lifted his head from the gurney. “Eight minutes later, at 6:19 p.m. CDT, he was pronounced dead. This entry was posted in Uncategorized and tagged death penalty, death row, death sentence, death watch journal, execution, Rogelio Reyes Cannady, texas prisons. Bookmark the permalink.